Andromeda is a Science Fiction Series programme that first aired in 2000 and has been classified a PG certificate. This science-fiction series, based on an idea by the great Gene Roddenberry (Earth: Final Conflict, Star Trek, Planet Earth), follows the lives and careers of the crew of the Andromeda Ascendant, a living starship serving in the military force of the Systems Commonwealth. 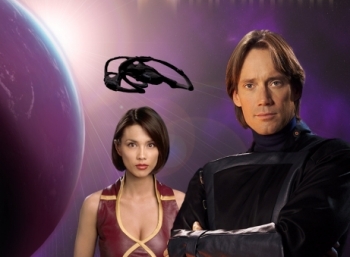 The captain of the Andromeda is Captain Dylan Hunt (Kevin Sorbo), a man of action, strong, determined and confident. Hunt and his ship become frozen and remain in that state for several centuries until a passing salvage ship revives them. On his awakening Hunt is horrified to discover that the Commonwealth has now collapsed and all known galaxies have slipped into barbarism following a civil war that plunged the Commonwealth into darkness and civilizations into ruins. Hunt, now the last starship captain of the System Commonwealth Fleet, has decided there is only one course of action to take - he must try and restore the Commonwealth to it's previous status, to take his ship on a trip around the cosmos in a last desperate attempt to restore law and order to the known galaxies. Finding himself alone in this disorderly universe, Hunt forms a friendly association with a group of mercenary aliens who sign up to crew his ship. Included are: an Earth-born engineer who can hack into the computer, the female captain of the freighter that rescues Andromeda, the purple Trance Gemini about whom we will know very little, and a female-looking 'construct' that is the personification of the ship Andromeda Ascendant. Also known as "Gene Roddenberry's Andromeda"
When is Andromeda next on TV?